Tranmere fought back to end Morecambe's 100% winning record in League Two. Shrimps captain Mark Hughes opened the scoring when he headed in at the far post from Jamie Devitt's corner. 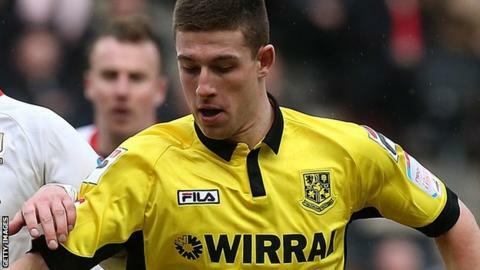 However, Tranmere improved in the second half and Cole Stockton took the ball around Barry Roche before firing past defenders on the line to equalise. Hughes was later sent off for an off-the-ball incident with Kayode Odejayi, before Stockton turned in Matt Hill's cross for a dramatic late winner. It completed a superb week for the young striker, who signed a new long-term contract with Rovers in midweek. "That's football - you've got to take it on the chin. "We've been winning recently and I've made sure we've not been getting too high. Tonight I've got to make sure we don't get too low. "We've got to be level-headed and look where we can improve. It's disappointing to lose in the manner we have, with 10 men in the 92nd minute." Match ends, Tranmere Rovers 2, Morecambe 1. Second Half ends, Tranmere Rovers 2, Morecambe 1. Attempt missed. Jack Redshaw (Morecambe) right footed shot from outside the box is high and wide to the right. Abdulai Bell-Baggie (Tranmere Rovers) is shown the yellow card. Foul by Abdulai Bell-Baggie (Tranmere Rovers). Goal! Tranmere Rovers 2, Morecambe 1. Cole Stockton (Tranmere Rovers) right footed shot from the centre of the box to the bottom left corner. Assisted by Matthew Hill. Attempt missed. Cole Stockton (Tranmere Rovers) header from the left side of the box is just a bit too high. Substitution, Morecambe. Jack Redshaw replaces Andrew Fleming. Attempt missed. Abdulai Bell-Baggie (Tranmere Rovers) right footed shot from the right side of the box is close, but misses to the left. Attempt saved. Cole Stockton (Tranmere Rovers) right footed shot from the left side of the box is saved in the centre of the goal. Corner, Tranmere Rovers. Conceded by Kevin Ellison. Substitution, Morecambe. Chris Doyle replaces Jamie Devitt. Attempt saved. Max Power (Tranmere Rovers) right footed shot from the left side of the box is saved in the bottom right corner. Kayode Odejayi (Tranmere Rovers) is shown the yellow card. Mark Hughes (Morecambe) is shown the red card. James Rowe (Tranmere Rovers) wins a free kick on the left wing. Marcus Holness (Tranmere Rovers) wins a free kick on the right wing. Goal! Tranmere Rovers 1, Morecambe 1. Cole Stockton (Tranmere Rovers) right footed shot from the centre of the box to the bottom right corner. Substitution, Tranmere Rovers. Kayode Odejayi replaces Eliot Richards. Paul Mullin (Morecambe) wins a free kick on the right wing. Corner, Morecambe. Conceded by Matthew Hill. Hand ball by Paul Mullin (Morecambe). Danny Holmes (Tranmere Rovers) wins a free kick on the right wing. Hand ball by Eliot Richards (Tranmere Rovers). Eliot Richards (Tranmere Rovers) wins a free kick in the defensive half.